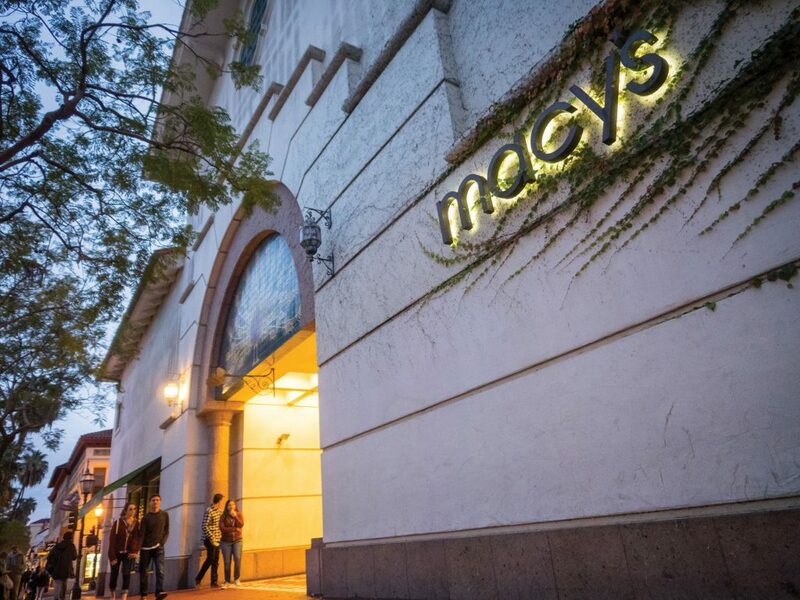 The closure of Macy’s in the Paseo Nuevo mall has had an impact on State Street shopping. Loitering, panhandling and a lack of mixed-use development are just a few items on a laundry list of issues that have piled up for Santa Barbara’s State Street retail district. A study released on June 9 added a few more items to the list but also hinted at ways to clean things up. Downtown Santa Barbara, through private funding, hired Seattle-based retail consulting firm Downtown Works for guidance on how to fix the rising tide of vacancies and other issues affecting retail on State Street. The study determined that street civility was the No. 1 issue, reflecting the fact that many see the homeless and panhandlers as something that must be addressed. And it suggested that Santa Barbara might look outward to San Luis Obispo or Ventura for ideas on how to revitalize its downtown. Downtown Works also concluded the mix of retail on State Street is not unique enough, with too many similar stores, for example, selling T-shirts or gifts, and too many mall-type shops that can be found elsewhere. Those appeal only to tourists and a young demographic, the study said. But McCauley said the retail stores on State Street need to do a better job attracting foot traffic. Approximately 28 percent of the 175 retail storefronts in the study area scored below standards in terms of the experience they offer. Twenty-five miles away, the city of Ventura’s Main Street is trending in a slightly different direction, something that could just be cyclical, said Bruce Stenslie, president and CEO of the Economic Development Collaborative of Ventura County. Other reasons Stenslie alluded to as to why Ventura’s Main Street is on an upward trend are its lack of dependence on big name stores. While Ventura uses locally owned boutiques and specialty shops to keep its walkable downtown lively, more than 120 miles up the coast downtown San Luis Obispo is relying on community gatherings to keep its downtown thriving. “We do a very high volume of weekly events to keep it attractive and vibrant,” said Dominic Tartaglia, executive director of Downtown SLO. Some of those ways downtown ambassadors are getting retail stores more involved are through the internet. Downtown Works also recommended ambassadors similar to the ones in SLO — advocates that can both build relationships with landlords and give support to the retail operators. A retail advocate would promote policies and regulations that support a strong retail environment, the report said. Downtown Works also addressed the Macy’s vacancy. The study says the former Macy’s site in the Paseo Nuevo mall offers a prime opportunity to improve State Street and the city should encourage residential development along the popular strip to bring steady traffic to retailers. However, Downtown Santa Barbara said a lack of parking could be the biggest issue preventing mixed-use development from moving forward. The study also recommended the city fix some of its sign ordinances to make storefronts more attractive to shoppers. State Street, however, doesn’t necessarily reflect Santa Barbara retail as a whole. Thriving neighboring areas like the Funk Zone and the redevelopment of Santa Barbara’s waterfront are bringing popularity to Santa Barbara, just not necessarily State Street.